cv. of ionantha? x concolor? Tillandsia ‘Flaming Maurie’ by Butcher in Bromeletter 32(5): 14. 1994 Maurie's ionantha - The name on the packet said ionantha when Maurie sowed the seed. However, when the more robust ones flowered and were circulated around Melbourne, it was clear that they were not T. ionantha. 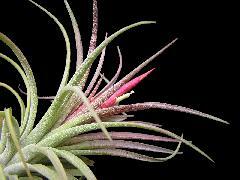 Someone decided that they looked like a Tillandsia achyrostachys hybrid so the same plant was around under two names - T. ionantha hybrid and T. achyrostachys hybrid. However, the name on the seed packet seems closer to the truth especially if we think of the old variety 'scaposa'. A more likely father than Tillandsia achyrostachys would be T. concolor but all of this is pure conjecture. Because of the probability of it being a hybrid and the fact that the leaves show a hint of red at anthesis, perhaps a common name such as 'Flaming Maurie' should be used. Note added Feb 2010. It seems that Len Summers in Melbourne has not changed his label!